Seeing some of the Bay Area’s best actors collected on one stage is a pleasure in and of itself. But Lee Hall’s The Pitmen Painters has other things to recommend it like its unapologetic championing of the arts as an essential part of being a fully formed human being. Bringing this true story to life are James Carpenter, Dan Hiatt, Jackson Davis, Nicholas Pelczar and, in perhaps the most revealing performance, Patrick Jones. They’re all wonderful actors, and to see them interacting and playing off of one another is worth the ticket price alone. I reviewed the production for the Palo Alto Weekly. You can read the review by clicking here. To Hall’s credit, he keeps the focus on the art teacher and the miner-artists and everything their success meant in terms of class, creativity and the artistic potential in every person if given the opportunity to express it. There’s no forced romance, no artificial drama, no Hollywood flourishes. But there’s still a lingering feeling that, despite the inspiring real-life story, what we have in “The Pitmen Painters” is less a play than it is a well-argued, well-intentioned plea for more arts and more arts education. 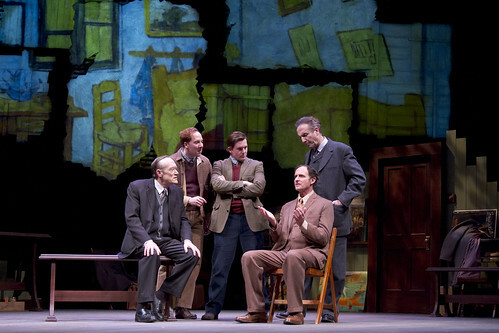 Lee Hall’s The Pitmen Painters continues through Feb. 12 in a TheatreWorks production at the Mountain View Center for the Performing Arts, 500 Castro St., Mountain View. Tickets are $19-$69. Call 650-463-1960 or visit www.theatreworks.org.